Where can Giant Hogweed be found? Giant hogweed is a native of the Caucasus Mountain region between the Black and Caspian Seas. It was introduced to Europe and the United Kingdom in the late nineteenth century and to the United States in the early twentieth century as an ornamental garden plant. It has become established in New England, the Mid-Atlantic Region and the Northwest. 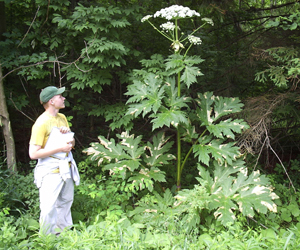 Giant hogweed grows along streams and rivers and in fields, forests, yards and roadsides. It prefers open sites with abundant light and moist soil but it can grow in partially shaded habitats, too. The map to the right displays the current confirmed locations of giant hogweed sites in New York State. If you come into contact with giant hogweed immediately wash the affected area thoroughly with soap and water and keep the area away from sunlight for 48 hours. This plant poses a serious health threat; see your physician if you think you have been burned by giant hogweed. If you think you have giant hogweed on your property, do NOT touch it. Please refer to the DEC's Health Hazards & Safety Instructions for Giant Hogweed for more information. Giant hogweed is a biennial or perennial herb in the carrot family (Apiaceae) which can grow to 14 feet or more. Its hollow, ridged stems grow 2-4 inches in diameter and have dark reddish-purple blotches. Its large compound leaves can grow up to 5 feet wide. Its white flower heads can grow up to 2 1/2 feet in diameter. Please refer to the DEC's Giant Hogweed Identification page for further help. Some other plants look very similar. Identify: Use the key the DEC's giant hogweed identification page to try and make a positive identification. Other plants that look similar are also shown. Photograph: Photos are needed to confirm identification. Take high resolution photos of the entire plant, stem, leaves, flowers and seeds, making sure to keep a safe distance. Report: Email DEC or call the Giant Hogweed Hotline: 1-845-256-3111. Provide photos, detailed directions to the plant infestation and estimate the number of plants. Control: If giant hogweed is confirmed, DEC will contact the landowner and may visit to assess the site and discuss management options, as resources allow.